One of RETTEW’s engineers has been named Young Engineer of the Year by the Pennsylvania Society of Professional Engineers, Lehigh Valley Chapter. 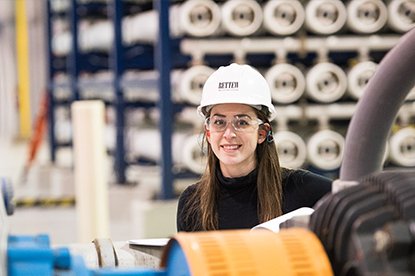 Elizabeth Helsel, known by her friends and colleagues as Lizzie, is an engineer in RETTEW’s Energy and Environmental Engineering group. Award winners are selected based on engineering experience, civic and local activities, educational achievements, publications, and technical society activities. Lizzie’s nomination included letters of recommendation from coworkers at RETTEW, the University Area Joint Authority for her engineering work on numerous projects there, and the President of the Society of Women Engineers, Lehigh Valley Professional Section. Lizzie’s many accomplishments include earning the Outstanding Achievement in Environmental Engineering Award from Wilkes University, founding the university’s chapter of the Pennsylvania Society of Professional Engineers, and serving as Vice President of Students for Environmental Sustainability for two years while pursuing her undergraduate degree. Currently, she holds the office of Outreach Coordinator with the Society of Women Engineers, Lehigh Valley Professional Section, and has done much to coordinate, streamline, and expand the organization’s outreach efforts, encouraging many others to support the communities. She is also an active member of the Water Environment Federation and Pennsylvania Environmental Association. Lizzie has regularly supported her community, serving as a mentor with the Howard Hughes Medical Institute/Women Empowered by Sciences, working with middle school students interested in STEM. She has organized several outreach opportunities in her role as Outreach Coordinator, including a clothing drive for the YWCA’s Perfect Fit for Working Women, and a STEM night program for middle school girls at Ever Middle School. She also coordinated with the Girl Scouts to develop and bring a robotics badge program to middle school girls in the Allentown School District. Her professional responsibilities include supporting the design, construction, and permitting of water treatment and distribution systems and wastewater treatment and collection systems for clients in the public and private sector. In 2017, Lizzie completed preliminary and final design of an $11 million plant upgrade project for the University Area Joint Authority in State College, PA. The design enhances the facility’s ability to remove nutrients, as well as overhauls the existing tertiary filters into denitrification filters. The upgrades will result in the facility providing 2 million gallons per day of effluent flow to local businesses, doubling its current output. Lizzie is currently an Engineer in Training and plans to take the Professional Engineer exam in 2019, after gaining the requisite years of experience. She will accept the award on February 22 at the Annual Engineers Week Banquet in Bethlehem, PA.
A huge congratulations to Lizzie – we couldn’t be more proud! !